Heat oven to 400 degrees F. Bring a large pot of water to a boil. While the water comes to a boil, make the Parmesan crumbs. In a food processor, pulse the bread to form small crumbs. Transfer to a baking sheet, drizzle with 1 tablespoon oil and toss to combine, then toss with the Parmesan. Roast until the crumbs are golden brown, 8 to 10 minutes. Once the water comes to a boil, cook the pasta according to package directions. Reserve 3/4 cup cooking liquid, drain the pasta and return it to the pot. Toss with the lemon zest and juice and 1/4 cup reserved pasta water (adding more if the spaghetti seems dry). While the pasta is cooking, cook the bacon in a large skillet over medium heat, stirring occasionally, until crisp, 6 to 8 minutes. Transfer to a paper towel-lined plate. Wipe out the skillet and heat over medium-high heat. Add the remaining tablespoon oil, then the zucchini and cook, tossing occasionally, until beginning to brown, about 2 minutes. Add the jalapenos, garlic, 1/2 teaspoon salt and 1/4 teaspoon pepper and cook for 1 minute. Reduce heat to medium, add the corn and cook until heated through, about 2 minutes. Toss with the pasta. 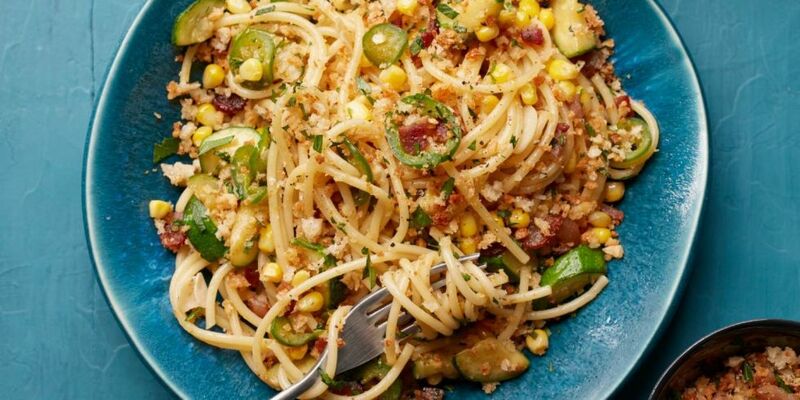 Toss parmesan crumbs with the parsley and bacon and serve over the pasta.